Shalom branch of the Royal Canadian Legion was established on October 19th, 1944. The purpose of the organization was to help returning Jewish service men and women from the battlefields of World War II. In November of 1944 Charles Gorvich was elected as the first president of the branch. The branch was recognized by the Canadian Legion in the spring of 1945, under the official name of Fairview Branch No. 178, Canadian Legion B.E.S.L. (British Empire Services League). 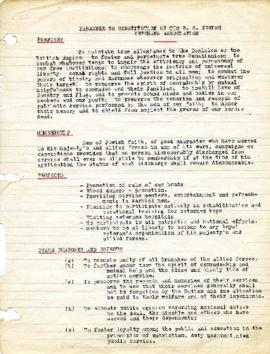 The constitution of the branch stated its purpose as following: to maintain true allegiance to the Dominion or the British Empire; to foster and perpetuate true Canadianism; to combat whatever tends to impair the efficiency and permanency of our free institutions; to encourage the doctrine of universal liberty, equal rights and full justice to all men; to combat the powers of bigotry and darkness wherever originating and whatever their target; to observe the spirit of comradeship by mutual helpfulness to comrades and their families; to instill love of country and flag; to promote sound minds and bodies in our members and our youth; to preserve the memories and records of patriotic service performed by the men of our faith; and to honour their memory and to shield from neglect the graves of our heroic dead. Membership was to consist of men of Jewish faith of good character who have served in His Majesty’s and Allied forces in any of its wars, campaigns, or expeditions provided that no person dishonorably discharged from service shall ever be eligible to membership if at the time of his application the status of such discharge shall remain dishonorable. The organization stipulated that members will be free to belong to any loyal veteran’s organization of his Majesty’s and allied forces. 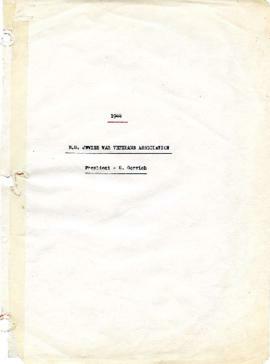 The following projects were to be undertaken: promotion of war bonds; promotion of blood donations; providing service centers, entertainment and refreshments to service men; planning to participate actively in rehabilitation and vocational training for returned boys; visiting veteran hospitals; and participating in all patriotic and national efforts. Other purposes and objects of the organization were: to promote unity of all branches of the allied forces as well as further among them the spirit of comradeship and mutual help and the close and kindly ties of active services; to preserve the records and memories of their services and to see that their services generally shall not be forgotten by the nation and due attention be paid to their welfare and of their dependents; to educate public opinion regarding national duties to the dead, the disabled and others who have served and their dependents; to foster loyalty among the public and education in the principles of patriotism and duty; to support suitable undertakings for the training, employment and settlement of ex-service men and women and education of their children; to pass on to their families and descendants the traditions for which they stand; to assist comrades now serving especially in connection with their return to civil life and to safeguard the interests of their dependents whilst they are in service; to assist ex-service men to secure not less than the recognized standard rates of wages in accordance with their ability; and to co-operate with Empire and allied associations of similar aims and objects. The main activities of Fairview Branch No. 178 fluctuated between decades. During the first several decades after the branch’s founding, branch activities were focused on rehabilitation and community work, particularly for needy veterans and their families. Legion activity in the 1970’s was focused on the Maple Crest housing project, and on supplying medical equipment to various health facilities. The branch notes that by the 1980’s the Fairview Branch No. 178 was experiencing some financial restraints that somewhat curtailed its ability to participate in community service. However, from the mid-1980’s onwards the branch found more financial success, and managed to continue its community service activities. The fonds consists of administrative and operational records of the Royal Canadian Legion, Shalom Branch No. 178. The fonds is arranged into 4 series: Minutes; Correspondence; Donations; and Memorabilia.